I went to my first professional soccer game tonight. Our friend Scott is a huge soccer fan and going to a game while he was in Florence was his only request. Lucky for us that team Italia was playing Malta in Florence this week. It was fun to be surrounded by Italians enjoying their favorite sport. 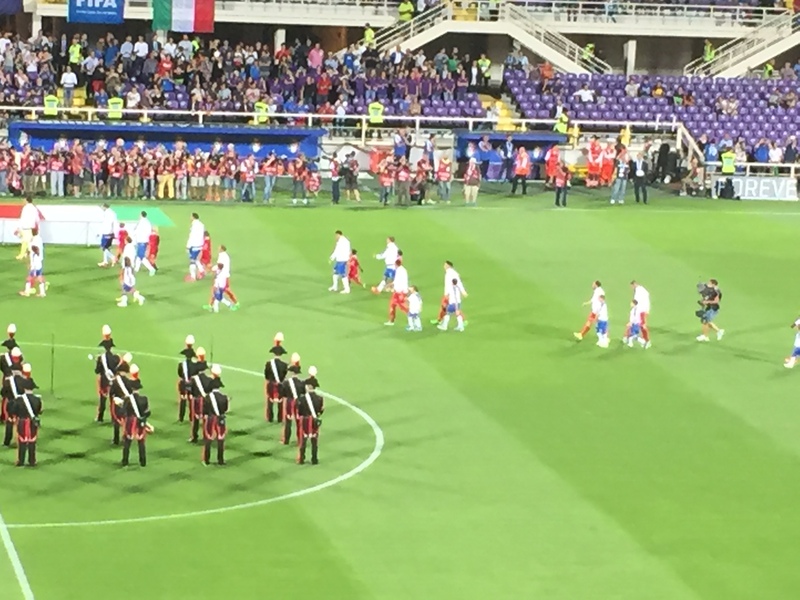 I noticed that when the band played the Malta national anthem, about ten percent of the Italians stood. When the Italian national anthem was played, all the Italians stood and the small group of fans from Malta all remained standing. The game started at 8:45, so we had time for lots of adventures during the day. 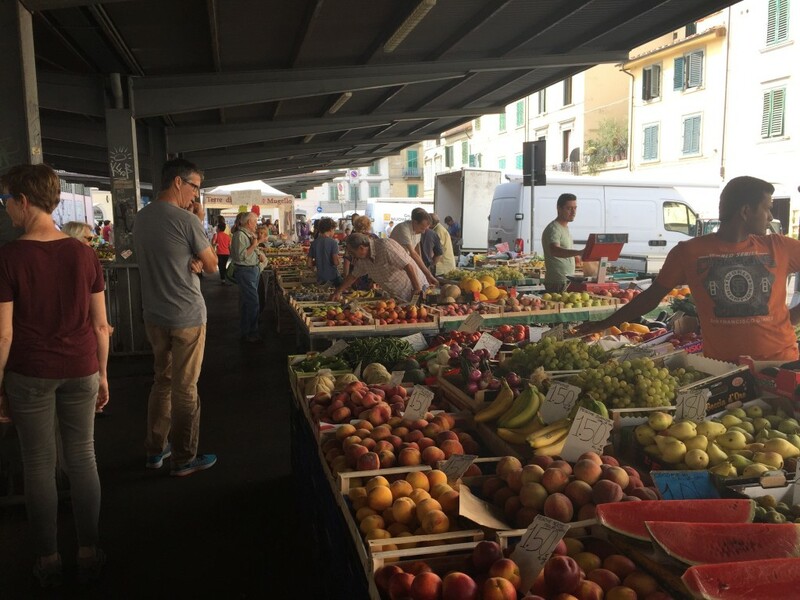 After another great al fresco breakfast, our first stop was the San Ambrogio market. Recommended by our landlady, it is patronized primarily by locals. Like they do at the French markets, the vendors select the produce for you. You just tell them (or in my case point to) what you want. After the market, we embarked on a walking tour of the Oltrarno, area. 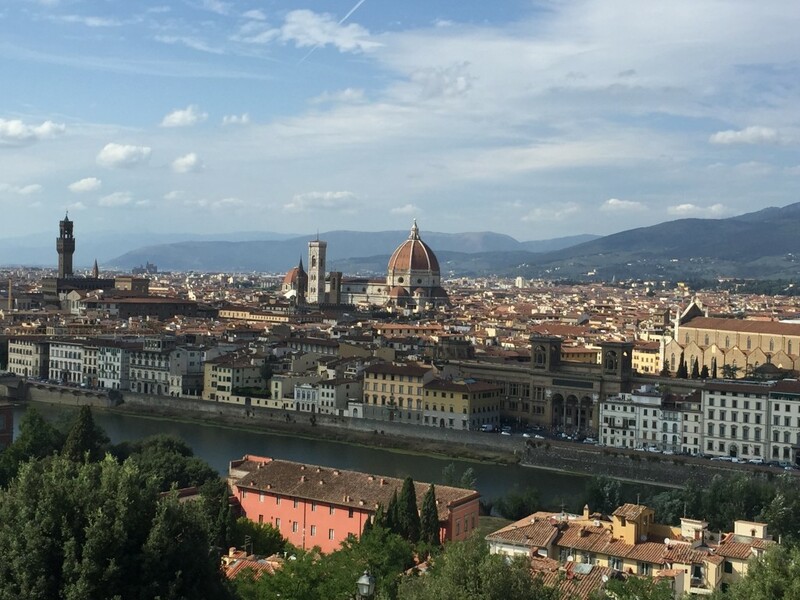 Across the Arno river from the central part of Florence, the Oltrarno is primarily home to artisans’ studios, antique shops and bars and little restaurants. The Pitti Palace was our first major stop. The amazing and abundant treasures in the Medici family home illustrated the richness and accomplishments of the Renaissance. 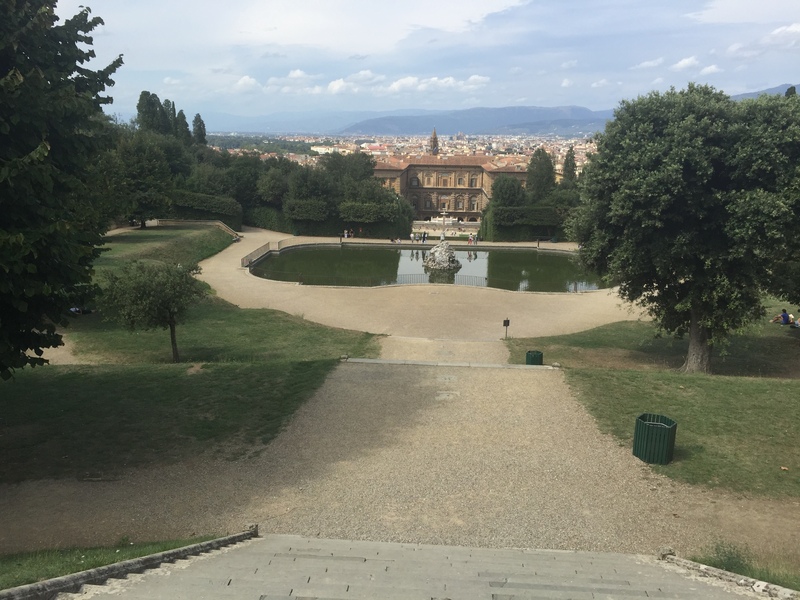 We walked up the Boboli Gardens incline and were rewarded with a beautiful view of the gardens and palace below. Forte del Belvedere, a 16th century fortress, sits right next to the top of the Boboli Gardens, so we were able to visit it without walking another steep climb. 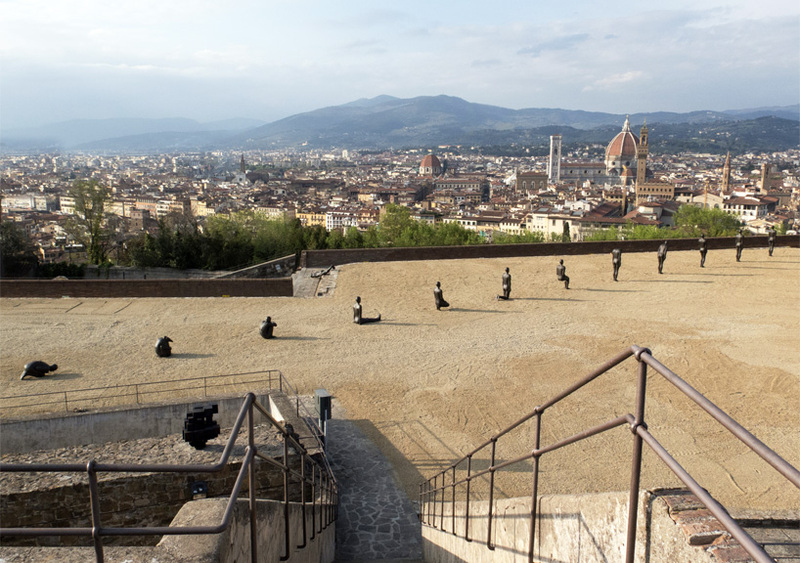 Sculptor Antony Gormley’s exhibit “Human” of more than 100 human figures is currently installed throughout the fortress. A few more sights, and it was time for lunch. 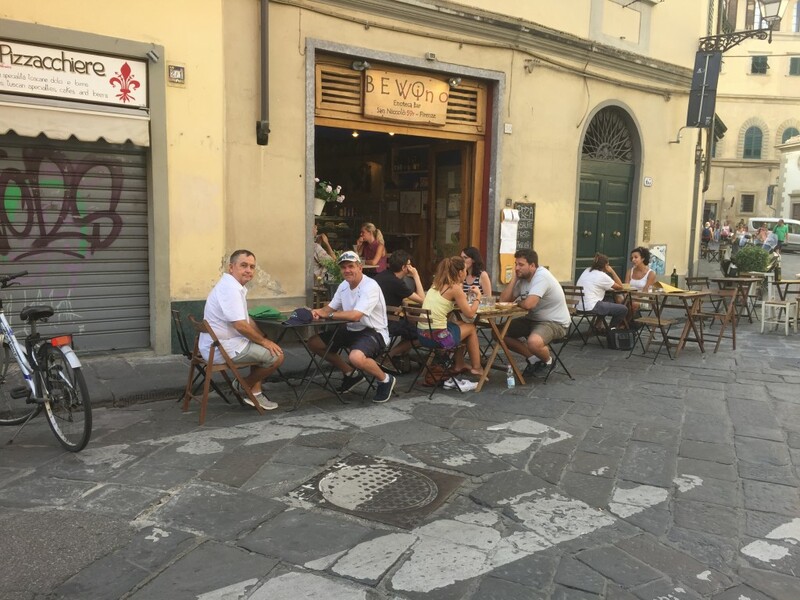 Often at small restaurants in Florence, the outside tables sit right on the edge of the road. We then hiked to Piazza Michelangelo for the best view of Florence , had our daily gelatto treat and returned to our apartment to rest up for the big game. This entry was posted in Italy 2015 on September 3, 2015 by debbie.